Paris is particularly beautiful in the summer. This July, Slots Capital Casino is taking players to the City of Light via its Champs Elysees online slot game from Rival Gaming. Next week, everyone that makes a minimum deposit will get either 50 or 100 free spins on the luxurious real money online slot game. Paris has exquisite cuisine, beautiful artwork and architecture, and high fashion shopping. The Champs Elysees is one of it’s most famous shopping areas. Beginning at the Place de la Concorde, it passes through the Arch de Triomphe. Lined with theatres, cafés, and luxury shops, it’s one of the most fashionable boulevards in the world. 200% and 250% casino bonuses will be available later in July. 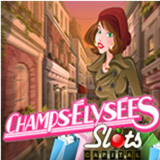 In the Champs Elyssees online slot game from Rival Gaming, the Eiffel Tower is the Wild symbol. On reels 1, 3 and 5 it expands to cover the entire reel, creating additional possibilities for winning combinations. Arch de Triomphe symbols can trigger up to 40 free spins with 3X multiplier. Hitting three or more Paris Map symbols during free spins triggers a bonus game where players go shopping and earn instant cash prizes. Available July 10 – 16, 2017 only. No maximum cash-out for either bonus. 60X wagering requirement. Later this month (July 17-23) the casino will offer a 200% deposit bonus that includes 50 free spins on the Jolly Rogers pirate-themed slot. At the end of July (July 24-31) a 250% Carnival casino bonus will be offered. Slots Capital specialises in online slots but also offers a selection of table games like Blackjack and Roulette. Its newest casino game is Midas Touch, a glittering gold 3-reel slot that’s now available in the download and instant play casinos for desktop and laptop computers and in the mobile casino for smartphones and tablets.